The South Carolina Aquarium was the perfect backdrop for the Southern Sparkle shoot. A Low Country Wedding magazine invited Salthouse, along with other Charleston wedding vendors, to bring to life Pure Luxe Bride’s vision of a nautical wedding. Bright pink roses and peonies were complemented by deep blues in the linen and river, all highlighted by glimmering gold champagne flutes. On the menu we kept with the nautical theme, preparing some of our favorite seafood selections. Chef Todd Mazurek prepared, Clammer Dave’s Littleneck Clam Ceviche with rainbow carrots served in the shell and mini beet napoleons with multi-colored beets and local goat cheese. Next was the arugula salad with citrus gems, pine nuts and shaved Pecorino Romano served with a chilled tomato gazpacho. For the main dish, we plated a filet of seared grouper atop a bed of Charleston Gold rice with grilled peaches and heirloom radishes. All of the produce and fish we featured was fresh, seasonal, and locally sourced. 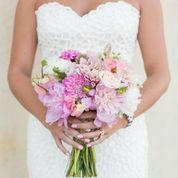 Photographer Dana Cubbage captured colors and textures of the food, complemented by beautiful flowers provided by the Charleston Flower Market, linens and flatware from Eventworks and the lovely model Blake Bush in her Modern Trousseau dress. Salthouse had so much fun working with other local wedding vendors to create this perfectly nautical and one-hundred-percent Charleston wedding!